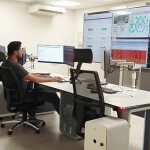 Today, the visualization of information is a key part of the work of operators in control centres around the world. 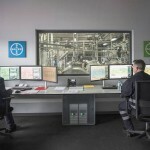 Having ergonomic systems that guarantee safety at work is essential. The ergonomic supports allow us to situate the visual systems at a suitable height and distance to guarantee the correct visualization of the same, as well as to guarantee the health of the operator. GESAB has developed different technologies to adapt to the highest demands, thanks to innovative systems. The first of the ergonomic support systems and the simplest is the fixation on the console envelope itself. The perforation in the envelope allows placing the ergonomic arms to hold the monitors. This system, although more economical, does not allow variations in the future neither in terms of the increase of screens nor in their disposition. If what we are looking for is a free work surface, the Access Rail system will provide us with all the space we need. It is a fastening system that comes from the life of the control console, so it does not affect the envelope. 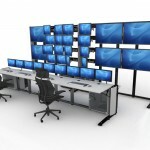 This solution allows the monitors to be placed online and even grow in height with total security. 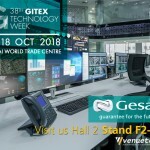 GESAB has been able to understand the needs of operators in critical work environments and, for this reason, it has known how to develop a unique system, we are talking about WiRail. This system based on a rail through which we can adjust the ergonomic arm at any point of its length. Available in both horizontal and vertical versions, it is one of the most versatile ergonomic support systems. 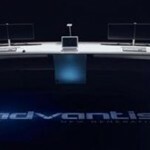 Allows full freedom of location of monitors ensuring their support. It allows the console to evolve according to the needs of the room and the operator. The Wirail system evolved to its 4D version; we speak of a support designed under a rail in which the ergonomic arms can move freely and easily. 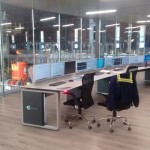 This system is ideal for the visualization systems to adapt without problem to each operator. 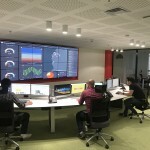 Let’s imagine a 24/7 control centre where 3 operator shifts usually work, in the same console everyday people with completely different needs work. The Wirail 4D system provides absolute freedom of movement.